No, Democrat wonder candidate du jour Pete Buttigieg is not some bridge-building centrist who really gets the vibe of Normal Americans and promises to bring us all together in a festival of hugging and liking each other. That’s a con. He’s just another leftist who wants to do all the same miserable things to people like you and me that every other pinko trying to pick up the torch from Felonia Milhous von Pantsuit wants to do. Only to get past our defenses, to avoid tripping our alarms like Big Chief Liz and Willie Brown’s Ex do, he tries to be really low-key and boring about it. And oh, is he ever boring. He looks like Sheldon on that Big Bang show, and when he talks you want to throw back your head and moan as the goo-goo clichés wash over you. He’s so boooooooring; he sounds like he’s always on the verge of chiding you to use your inside voice. Even Beto is more interesting, and Beto is not interesting. Plus he’s gay, you know – another thing that’s boring about him, although the media makes like it’s some super-hip and exciting twist. Welcome back to the cutting edge of 1979 – he’s gay, and he’s definitely going to freak out the squares whether they like it or not! In that vein, he recently bravely took on the Veep’s non-comments about him and being gay and so forth. Here’s the most recent public comment by Mike Pence on Pete Buttigieg, uttered in 2015. Brace yourself for this fireball o’ hate! Now Pete is bravely resisting this raw, four-year-old bigotry! Take that, super-confused nice guy Mike Pence! 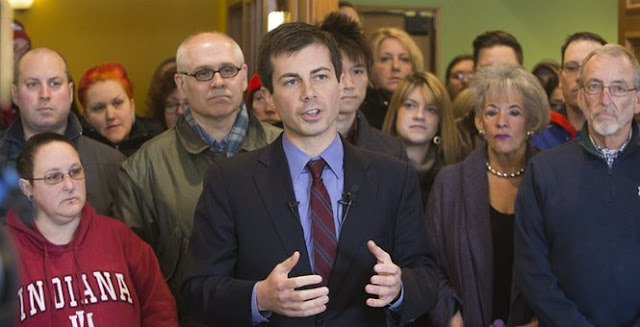 Pete Buttigieg is not going to just stand there while you don’t talk about him and his gayness! Gay liberation has truly become mainstream when all it provokes is a yawn among the Normals, and you have people like Pete having to pretend that he’s being oppressed. He’s like those kids in Footloose– they’re going to dance to their rock n’ roll music no matter what, and you Jesus-loving prudes can’t stop them! We’re supposed to breath a sigh of relief that he allegedly doesn’t outright hate religious Americans like his coastal comrades do. Phew! He is really upset about “hypocritical” Christians who like Trump – you know, the guy who actually stood up against Christian persecution in American society – and he was happy to tell us how we don’t meet his exacting Jesus standards. Luckily for us, Protestantism is all about telling dorks like him to take his theological deep thotz and stuff them where the hymns don’t echo. Buttigieg was in the Navy too. Again, this is another resume line item that is supposed to make us Normals overlook his deeply ingrained leftism. John Kerry was also in the Navy, and his gambit didn’t work out either. When are Dems going to figure out that doing a tour is cool, but it’s not a “Get Out of Liberalism Free” card? Also, he was an intelligence officer. Two kinds of guys are intel officers. One is the really smart guy that nothing gets past. I liked those guys. The other is the guy the commander doesn’t want to trust with an important job, like passing out volleyballs. I don’t know which kind Buttigieg was; maybe he was squared away, maybe he was focused on coffee-making ops for the command group. So, the university-based presumption of smartness is pretty presumptuous. Just saying. We keep reading how Mayor Pete, of the thriving wasteland that is South Bend, is a super-moderate moderate of moderation. After all, he recently confessed that he is a “capitalist,” which in this Dem primary makes him practically Barry Goldwater. Oh, but he qualified that – it has to be “democratic capitalism.” You know, when strangers get to vote on what you can do with your own money, it’s not actually capitalism, is it? Where is he on other stuff? He’s perfectly happy to dictate every aspect of your life because of the global warming scam. No cars, no planes, no Big Macs for you! Pete knows better. He wants to take over your health care because the present system – you know, the one that Obama and liberals like Mayor Pete put into place – is a total failure. Don’t worry, they will get it right this time! Those Harvard guys are super smart, you know. He’s willing, eager even, to raise taxes because – just like every other liberal – Centrist Man thinks he’s better able to determine how to spend the money you work for than you are. He’d also ban the guns you choose to use to protect your freedom from aspiring totalitarians, which strikes me as a real conflict of interest considering his keen interest in totalitarian control over every aspect of your life. In fact, if you look at everything Pete Buttigieg is promising, you will not find one single proposal that either increases how much of your own earnings you get to keep or that increases your freedom. Not one. Just like with every other liberal Democrat, everything he would impose upon you will make you poorer and less free. But to him and his ilk, that’s fine, because your prosperity and your liberty are not the goals. They are obstacles to the real objective – more prosperity and more power for people like Pete Buttigieg. He doesn’t want a society where Americans come together. He wants to keep ripping us apart, while using his soothing tones and unity clichés to okey-doke us into letting him into the Oval Office. And if we are fooled again, like so many suckers were by Barack Obama, we’d find the new boss is the same as the old boss. Let’s face it – the America the Democrats are trying to trick us into accepting is not the one we want. As I chronicle in my action-packed novels about an America split apart into red and blue, People's Republic, Indian Country and Wildfire, their path does not lead to anything good. Step one to regaining our country is not to fall for pinkos in sheep’s clothing like this Buttigieg dude.